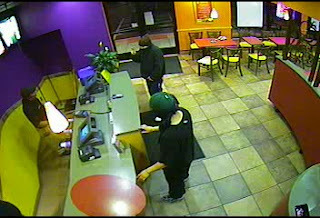 A man claiming to have a handgun and his accomplice robbed the new Taco Bell on Commercial Street South Thursday night, 07-05-07. Police believe this is the second time this duo has emptied the cash registers at the new Mexican fast food restaurant in the last two weeks. The men wore dark clothing, baseball hats and dark cloths over their faces. Both suspects are described as being around 5'5" tall. No one was hurt in the robbery. Police are looking at security camera videos and asking the public for tips about who these men are. 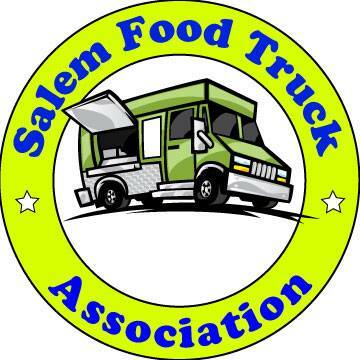 Call Salem Police Detective Dan Tallan at 503-588-6050 ext. 7132 if you have any information about this crime. 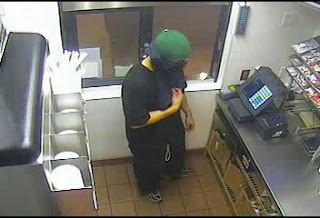 For the safety of diners and restaurant workers, let's hope Salem PD catches these guys before they strike again.